Multi Size: Sizes 8 to 16. I cut a size 14 – with hindsight I should have cut a 16 or at least done a FBA. it is on the snug side. Yes it did! Except for the buckles that I added. The original pattern has buttoned carriers instead. Generally the instructions were pretty easy to follow. However when it came to attaching the shoulder straps, it completely omitted that step and it wasn’t until I had attached the sleeves that I worked out that you were supposed to attach the shoulder straps at the same time as easing in the sleeves….! 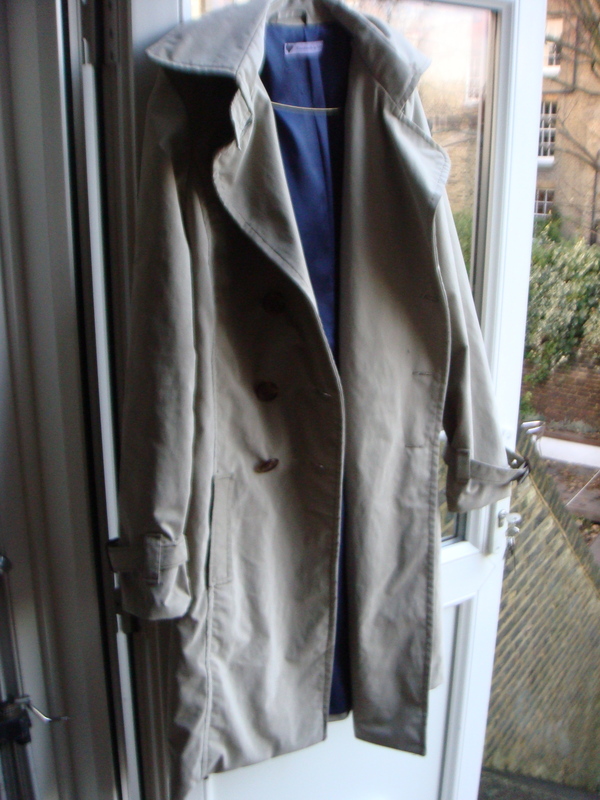 It’s a pretty classic trench, which is what I was after. What I hated – easing the sleeves in – one word – horrid! And the other, the amount of topstitching that I had to do. Plus despite a new needle and proper thread, my machine really does not like top stitching. Waterproof fabric which is shiny on one side and matt on the other. It has a lovely silky feel. I used the matt side. No idea what the fibre composition is I’m afraid, except that it was Prada! The lining is quite a thin silky material most likely Polyester, I picked this up for a £1 in a church sale. The buckles are from Klein’s – a haberdashery in London. 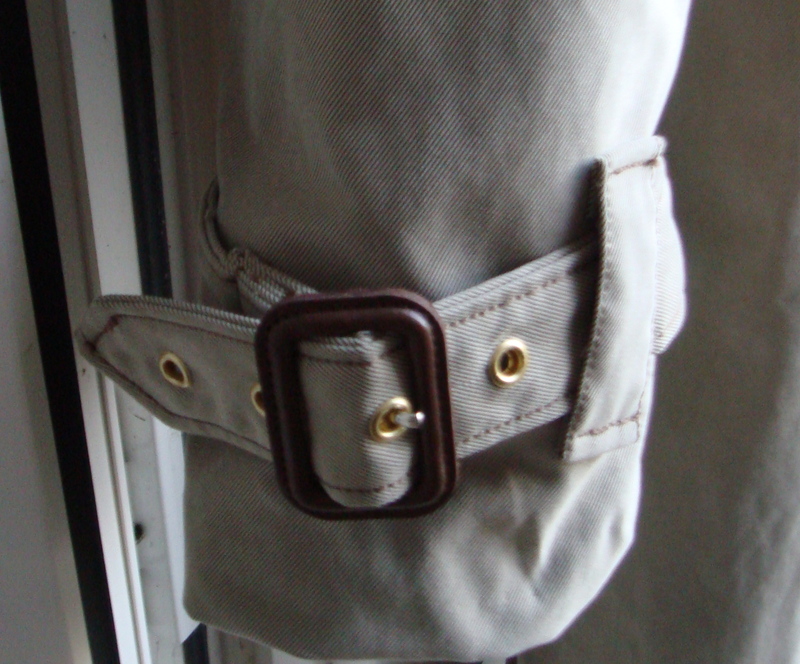 I used View E, but added the storm flap from View B and added buckles to the belt and sleeve straps. I also decided I didn’t like the pocket flaps and topstitched two rectangles instead. I should really have made a FBA adjustment on this and am annoyed with myself for not doing that! I probably wouldn’t sew this again in a hurry. It’s ok but fiddly. But then that is probably because I over complicate things! I’m really relieved it’s finished. Not going to be in a hurry to make this coat again but I know it will come in handy here in wet and windy England! « McCall’s M5525 – Finally Finished! 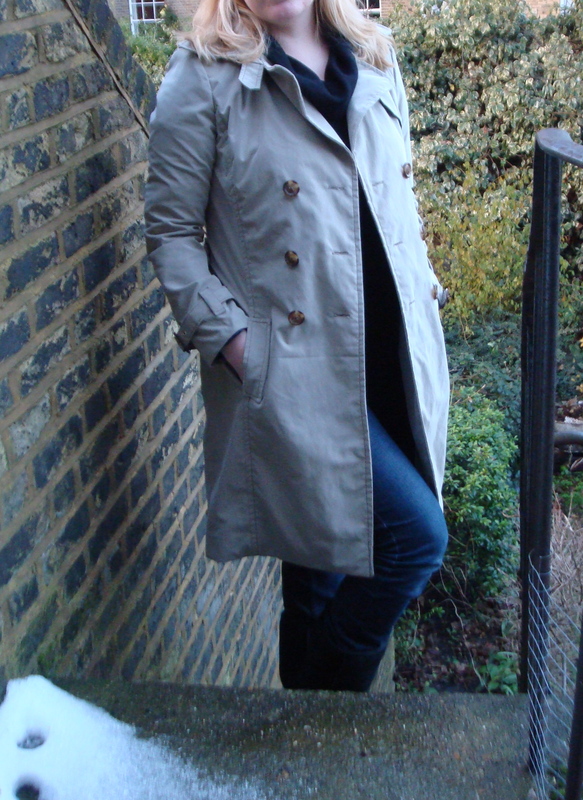 I spent some of this weekend trying to finish my McCall’s 5525 for the trench coat sew along too! Almost there with just the bottom hem to go. I’m so glad you said that about the shoulder tabs – I thought I was going crazy when I looked at the table and saw the 2 tabs and couldn’t figure out where I’d gone wrong. Unpicking the sleeves was absolutely NOT fun. Your version looks great. I love the classic look and particularly like buckles you used. Thank you so much! Yes the unpicking was a bit of nightmare! The buckles are from Kleins in London but you can order them online as well. Hope you finish your coat soon!